Forest property with sauna, 3 bedrooms with en suite bathrooms. 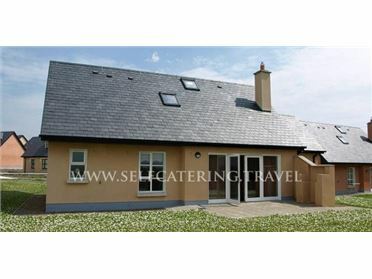 Holly House is situated in the middle of the Dromgarriff Estate, directly bordering the golf course, which belongs to the total property. The house has light rooms, spacious bedrooms and a large dining/living room with open fireplace. A sauna belongs to the house. luxuriously furnished in every detail. Complete with two terraces on different levels and surrounded by the estate's lush 150 year-old woodland. Holly House is above the Rockery, old gardens that once belonged to the Royal Roaches Hotel. A short walk over the hiking paths leads to your private coast with a view of the small island of Glengarriff Harbour. Bedroom 3 - 1 Extra Lg. Double Bed. Glengarriff is a small seaside village positioned on Ring of Beara surrounded by high rugged mountains pocked with old bogs being farmed for peat. Notable among local attractions are the Italian Gardens on Garnish Island (Ilnacullin), which may be visited by boat trip. Offering a broad view of the surrounding area, the round Martello tower on the island was built to guard against a threatened Napoleonic invasion that never materialized. In the nearby Glengarriff Forest is the glen that gave Glengarriff its name, (loosely translated as: rough glen) containing some of the oldest and most extensive oak and birch groves left in Ireland. A short but steep trail leads up to Lady Bantry's Lookout, offering a stunning vista of Glengarriff and the west Cork area. Also of interest are the Bamboo Park behind Toad Hall, the local amenity area featuring a new child's playground and Blue Pool lagoon, nearby Barley Lake and the historic Eccles Hotel.